A second day in Gjoa Haven proved to be a gift as we got a glimpse into the generous hospitality of the people in this community, as well as some of its challenges. After a presentation by the Parks Canada staff about the protection of the local sites of the wrecks of the Erasmus and the Terror (Franklin’s ships), we wandered the town to see what we could find. Many people warmly greeted us and stopped to chat; they were interested in the C3 ship and our journey. I made a point of visiting the local Co-op and Northern stores, both fixtures in many Arctic towns; I had heard about the shocking prices of food in the North, and wanted to see for myself. 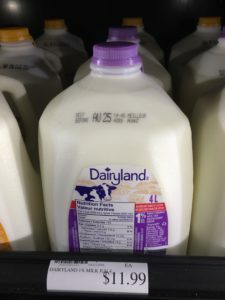 A few prices that would make feeding a family a challenge: &11.99 for 4L of milk, a large box of Cornflakes for $9.99, and $16.49 for 12 rolls of toilet paper! Surprisingly the produce wasn’t as expensive as I thought it would be, but I learned that it was subsidized to help get families on a healthier diet. This strategy isn’t working well however; despite alarming rates of diabetes in the North, the Inuit don’t eat a lot of vegetables as their traditional diet is rich in meat and fish. 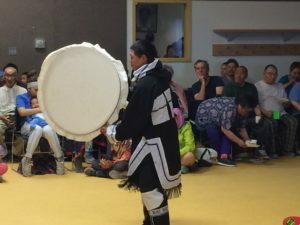 Health and wellness is a huge concern in isolated communities, and this one example demonstrates that there aren’t any easy answers in solving these complex challenges as they are connected to the social/cultural traditions and economic realities of the Inuit. Later in the day we went back ashore for a special event put on by the community just for us. The community centre was packed with families, with children of all ages playing and enjoying each other’s company. We were treated to a meal of ‘country food’, which means traditional Inuit delicacies such as caribou stew, seal, dried caribou, and air-dried char. There were many speeches (simultaneously translated into English and Inuktituk), throat-singing, drum-dancing, and presentations on Amundsen. 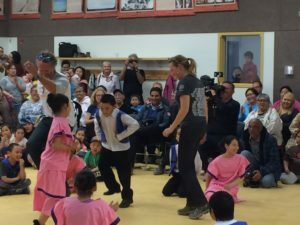 The highlight was a group of children performing a square dance, a favourite past-time in many Inuit communities; as they got a number of our group up dancing for the crowd, this proved highly entertaining as the children were far superior dancers. This was a heart-warming event, where we were introduced to the warm hospitality and focus on family in Gjoa Haven. What a wonderful end to our time in this community! This page took 0.292 seconds to load.